Bidding on the auction items has now closed. There are some "Buy Now" items still available (postcards and badges) which we shall leave live for a while. Earlier this year at The Capitol II you helped us raise over £1400 after tax relief to support an ongoing project run out of Muswell Hill Methodist Church. It provides accommodation and assistance for Syrian Refugees in the UK who have escaped the conflict in that sad country. Peter Capaldi and his wife Elaine lead one of the (secular) groups on the project. 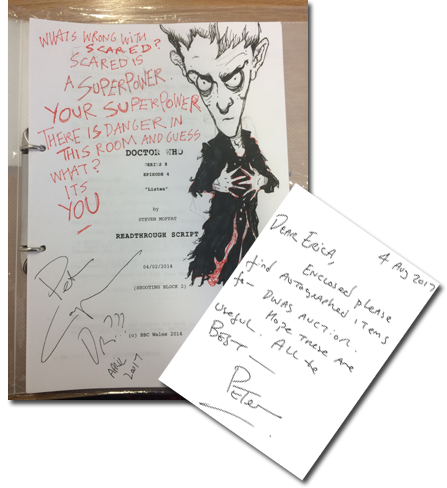 Following this, Peter has kindly donated a unique item for auction - his suitably annotated rehearsal script for the episode 'Listen' along with some other twelfth Doctor items. Bids for these are now open at our eBay site and we hope you will find time to take a look and maybe make a bid yourself. If you cannot afford to do that we have some other items there you can buy and still support the project.